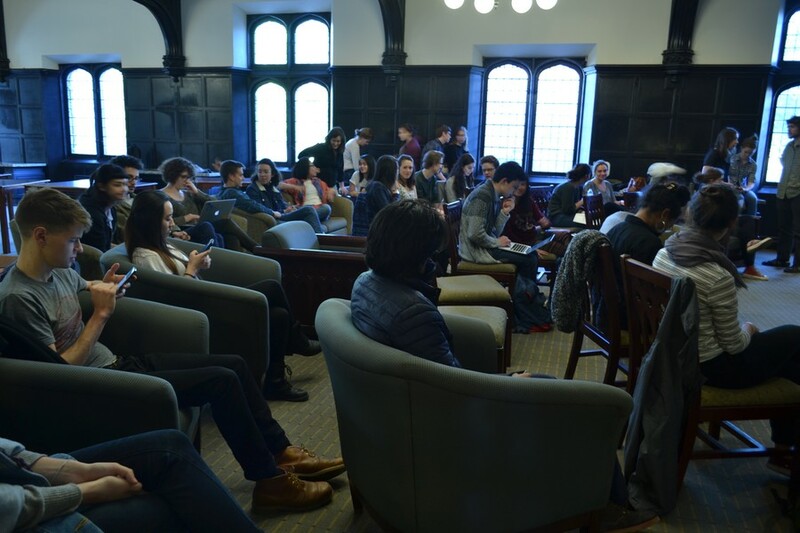 On Monday evening, over 50 student activists representing a variety of RSOs crowded into Reynolds Club to articulate their goals for administrative policy changes, including increased transparency and attention to undergraduate needs. The event was initially pitched as a town hall meeting with administrators, but no administrators showed. All of the student groups present, except the Phoenix Survivors Alliance (PSA), were affiliated with IIRON, a Chicago-based activism coalition “devoted to social, economic and racial justice through people power,” according to its website. Affiliated RSOs include FBU, UChicago Climate Action Network (UCAN), Students for Disability Justice (SDJ), and the Coalition for Equitable Policing (CEP). The administrative invitees, including Isaacs and Diermeier, are slated to meet with students in two upcoming forums. Isaacs is scheduled to answer questions in a Q and A session during the upcoming regularly scheduled SG meeting on May 23. According to second-year Simone Brandford-Altsher, an organizer with PSA, Diermeier has promised a meeting with that group after he takes office on July 1. The meeting was originally scheduled for April 27, but was postponed because of a conflict with an event honoring Myles Johnson, a student who recently passed away. E-mails shown to The Maroon indicate that on April 21, McAvoy invited Isaacs, Diermeier, Reisberg, and Ellison to the April 27 meeting. McAvoy said that he did not invite the administrators to the rescheduled meeting after they initially declined. In an e-mail to The Maroon, University spokesman Jeremy Manier emphasized that Diermeier had not yet become provost, and that Isaacs will answer questions at the SG General Assembly. The students argued that University administrators have ulterior motives when they choose to meet with students. After relating his experience as a first-generation college student who had extreme difficulty navigating the University’s financial aid system, Kissinger said that Isaacs’ scheduled appearance at SG is a misleading attempt to appear engaged with students, and that the University has not shown enough commitment to shared governance between students and administrators. “We go to this school to get an education. We should have a say over that education, and the way that educational institution asks. It makes me really angry that administrators don’t think that way. Administrators actively do not want to interact with students, and they remind us, too. And they ignore my e-mails, too. I have tried to meet with the provost’s office more times than I can count…when we wanted to talk about the way we oversee student life fees, they couldn’t get back to us. But as soon as [IIRON] asks to meet with the provost, I get an e-mail within 24 hours, asking when our next assembly is, so they can come and talk to you there. And that makes me really angry, because I don’t want to be used as a prop,” Kissinger said. Brandford-Altsher added that her interactions with administrators on issues related to Title IX and on-campus sexual assault prevention programming have led her to believe that the administration is not fully committed to evaluating PSA’s recommendations, which include hiring more Title IX staff, and that officials then cite a lack of staff resources as a reason for not meeting with PSA. For second-year Christina Uzzo, an organizer with UCAN’s campaign for the University to divest from fossil fuels, the University’s repeated reference to the Kalven Report, which was published by a University faculty committee in 1967 and recommended that the University maintain political neutrality in the interest of ensuring free expression, is not a defense against what she sees as the social danger of investing in fossil fuel companies. “The reason they cited was that the Kalven Report, which says that the University has to be politically neutral, but we feel that is not a reason not to divest. Because the money that is invested in fossil fuel companies...has already destroyed our environment, and it has led to many vulnerable people, put in even worse and more vulnerable situations,” Uzzo said. Alumna Brianna Tong, the lead citywide organizer of IIRON, related her own experience as an on-campus worker earning $8.50 per hour as evidence that administrators did not care about student needs.